This post is part of a series called D-D Remodel, where we’ll share the progress of renovating our Colorado mountain home. I’ll be posting updates regularly so be sure to check back for the latest. It’s been a bit quiet around these parts due to how hectic life has been lately, so I thought it was time to share what we’ve been up to. We had a big push to get the ground floor of our home habitable in time for family to visit of the holidays. (Read: make sure the shower was usable and clear a path through the construction to the back bedrooms. Nothing like a deadline right?) The good news is that we made it happen. The bad news is, there’s still quite a ways to go. Those of you who have been following along on Instagram stories know that the bathroom has been the major endeavor of this renovation. So today I thought we’d take a peek at the inspiration that inspired the bathroom remodel. I mentioned this in my “before” tour post, but I think it’s worth repeating, that it was the overall finishings that were just not my style. This bathroom felt dark and cramped to me, with the giant vanity taking up much of the room, and a tiny awkwardly shaped shower in the corner. I also took pause that this room didn’t have a window in it — the view from this side of the house is a stunning view of the mountains across (more on that in a later post, because that is a whole ‘nother story). It took a while for me to figure out the design direction for this bathroom, as I’m drawn to bright, airy spaces with some warm neutral accents (think Scandinavian with a bit of southwest thrown in). However, after some time on Pinterest, I found many of those spaces come off as super modern — something this house will never be. Its architecture is definitely a more traditional nod to the past, and I don’t want to completely rid the house of that. After all, it was that nod that we originally fell in love with. But I think there’s balance to be found, and to me, it’s that balance that makes a space interesting. 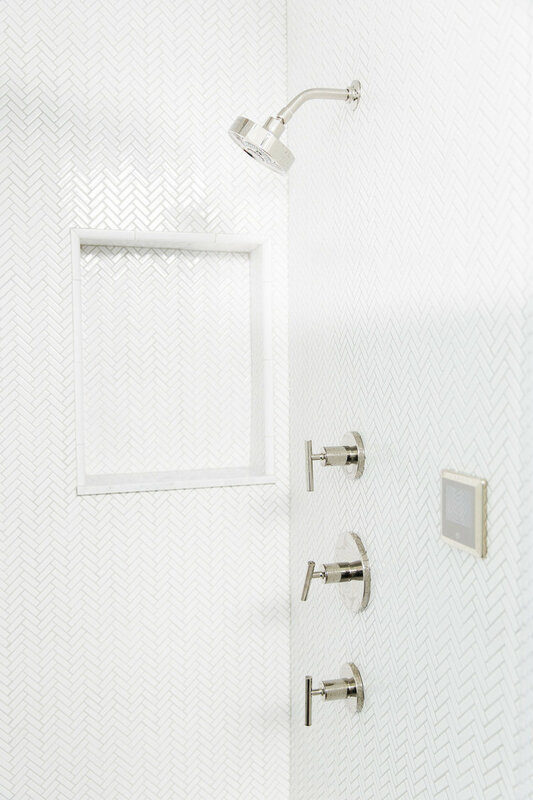 I was drawn to mostly white spaces (no surprise there) with texture in the tile and accents, for added interest. I was desperate to replace our larger builder’s mirror with a smaller more sophisticated one, perhaps bringing in some wood accent there or through a towel ladder. I loved the addition of natural elements in woven baskets, potted plants, and wooden stools — accents I felt would warm up an otherwise sterile space. I can safely say that we’re getting there. Much of this is already installed in the space and it looks ah-maz-ing. Don’t forget you might be able to steal a glimpse sooner if you follow along on Instagram stories! PS – Wondering about the steps I took that got me here? I have a new offering in the works to help you design your ideal lifestyle. Sign up below to be the first to know when it goes live!